Several months ago, I met the talented husband and wife team behind Spectrum and Riffle Vision. Carlton and Julia pack an amazing creative punch and I'm so happy to make introductions for those of you who have never had the privilege of knowing about them! (By the way, these two created the trailer for my sister Barb's recently released book, Furniture Makeovers!) Today, Julia is offering a beautiful Him + Her giveaway to one very lucky reader. I asked Julia to share a little bit about the process behind Spectrum and here's what she told me-- I started Spectrum about two years ago in a wood shed. My husband, a photographer and art teacher, delved into his latest project of building a press out of an old treadmill, while I stood and watched. If you know me, then you know I don't like to stand still. Surrounded by machines and wood scraps, I put my hands to work on an experiment that turned into something bigger and more beautiful than I expected. I've always loved working with my hands and creating things from scratch. I try to follow this simple little rule for Spectrum and my every day life: Make things from hand and heart, threaded with authenticity and with a passion for beauty and quality. I work primarily with woods such as rosewood, pine, oak and padauk, but sometimes include leather, clay and concrete. I like to start with raw materials, faceting and forming them with my hands. Cutting, sanding, painting -- I handcraft everything, right down to the packaging. I just recently added a men's line to Spectrum and am excited to expand with new products. If you like to get your Sweetheart unique gifts for Valentine's Day check out Spectrum's shop! Use Coupon Code LOVE for 20% off your purchase. Thank you, Julia! And good luck in entering, readers and friends! A winner will be announced and contacted on Thursday, February 6th! For Her // Brass Heart Studs + Natural Hand Faceted Wooden Necklace (available in gold or natural) Each bead is hand faceted by me and each one is unique. This necklace is one of my best sellers because of its natural beauty and the fact that it pairs well with almost everything. The chain is brass and 20" long. 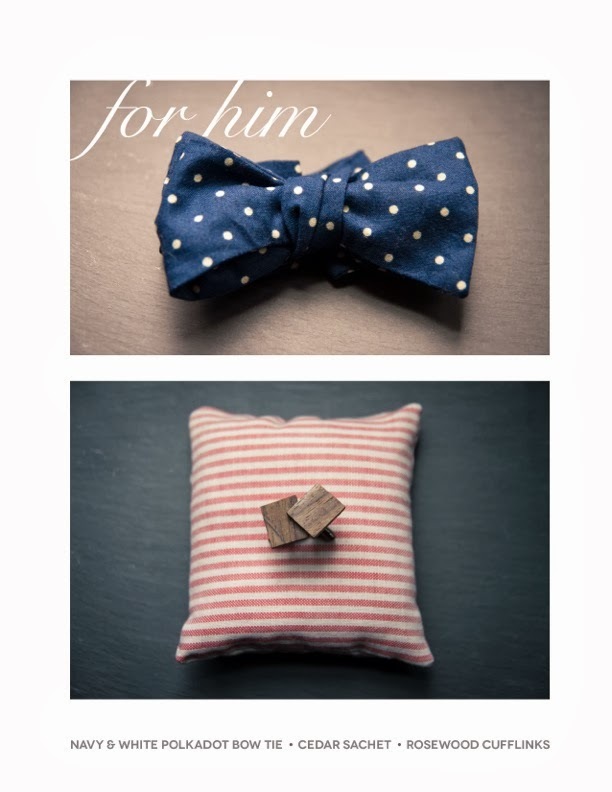 For Him // Navy + White Polkadot Bow Tie, handmade from a cotton material. It's a regular size and will fit a 14-18" neck or a small or medium shirt // Cedar Sachet, handmade from up-cycled fabric and filled with cedar shavings. Perfect for a dresser drawer and making your clothes smell woodsy // Rosewood Cufflinks, handcrafted from a dark rosewood. Perfect for the man that likes to dress it up. TO ENTER // Visit Spectrum and share, by commenting below, what your favorite find is and, tell me, are you ready for Spring yet? (smile and both hands raised over here!) Ready, set, enter away! 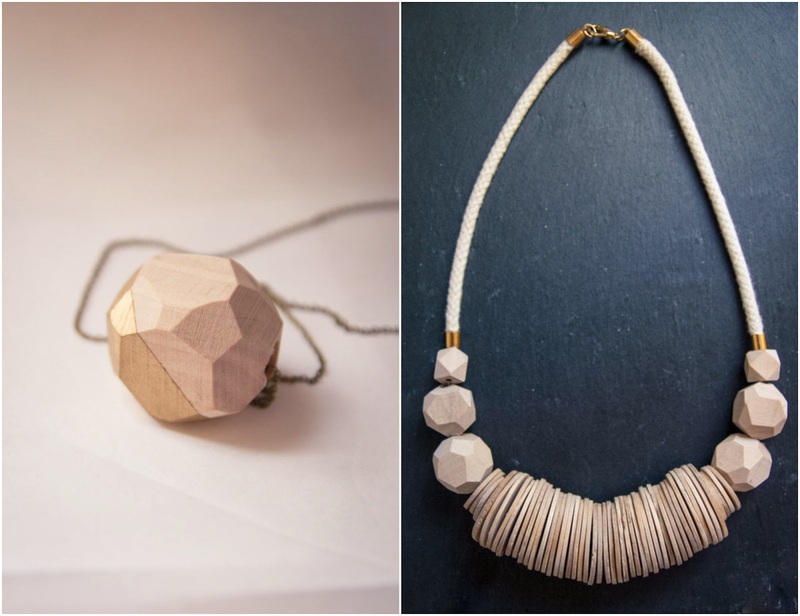 I love the pieces with natural wood but I also love the creativity and uniqueness of the "hide" necklaces! SO, SO ready for spring! It can't come fast enough! What beautiful pieces!! I've been recently falling more in love with simple beauty of wood. Love those wooden pearls, could wear that with everything! I love the gold dipped necklace... but to be honest all of their pieces are so cool! Love them all! Pretty! I like the Brass Crescent necklace. It's snowy here so I can't let myself think about spring just yet! I REALLY love the leather necklaces, especially the painted chevron. They are edgy in an understated way that I really like. I am so ready for spring; with it comes my son's first birthday--oh yeah and warmer weather, thank God! I love this b/c Carlton is my cousin:) What a small world right? Where did you meet them? They do great work and are very talented! I am ready for spring, but I would love a good snowfall first!! i love julia's stuff. and i can get it at a shop near me…..torture! love the gold dipped pendant. simple, but elegant. ok, so we had a pipe burst in our house three weeks ago, and the repairs afterwards found us making a home in a hotel for a week. as the temps keep dipping low each night, i am nervous that it will happen again. so….am i ready for spring? um, yep, i was yesterday !! I adore the bow tie! So many unique must haves! I'm enjoying the process of change here in the PNW. I'm so thankful that Spring will come much more quickly than we ever saw it in MN! Thank you for sharing Specturm. Erin's right, inspiring! I'd love a wooden necklace. I love the natural feel of that look. I also like the simplicity of those globe necklaces. What a great giveaway! Thank you so much for offering such a lovely and generous giveaway. The Ocean Blue Nautical Globe Necklace is definitely a favorite. They remind of those beautiful Norwegian glass floats. Spring can't come fast enough for me! Wow - her work is amazing! I love the Natural Beauty necklace. Her chevron pieces are great too! Thanks for doing the giveaways - so fun and always such pretty things! AMAZING shop! I love the gold dipped necklace. Thanks for hosting the giveaway!!!! i love the coral and gold necklace. such beautiful pieces. Love the triangle earrings and wooden bead necklace.. Bring on Spring ! I really like the concrete pyrite ring. I'm so ready for spring. I can't stand this weather and my wardrobe yearns for warmer days. Oh!!! That is so hard!!! All of their stuff is beautiful!! But the Natural Beauty necklace is just gorgeous...simple and elegant! As for Spring?? YES!!!! I wish it would be here tomorrow! Thank you for introducing me to this lovely shop! I love, love, love the brass crescent necklace + the matte black studs! If I didn't have a toddler, I'd say let it snow all spring… but with a little in tow, I need that spring warmth!